I’m not made for cold, rainy or snowy weathers. So when I flew from Mexico to Canada, I had to make a step. My heart was torn between the Uggs and the Sorel. 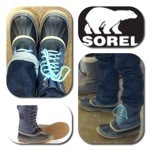 Finally I chose the Sorel 1964 Premium CSV, the blue ones with light blue laces. 1. Those boots were made before in Canada by a Canadian company. After economic issues the company was sold and is now part of Columbia Sportswear. It will be a sweet souvenir from my Canadian trip. 2. The shoes is a mix of leather, caoutchouc sole, waxed canvas with a removable/washable felt inner boot. 3. The felt inner boot can be used as slippers when you arrive in the mountain shelter. Those boots are great up to temperatures below 40C!! But they work well too while rainy and snowy winter days hits you. Price is sweet too and can be compared to the Uggs (Decatur Nordic, 159$), only 150$. Now you know where to put your feet. PS: Bonus, you receive an extra pair of grey laces. ← Like his curve ? Super cool , and you use too much the winter, good idea….